1. Log in to the C-Panel account with control over the domain. 2. In the Domains section, select Subdomains. 3. In the Create a Subdomain section, select the parent domain and enter in the subdomain you wish to host in the Subdomain field. 4. Set the Document Root to whichever folder the domain points too. In most cases, this will be some folder in the public_html directory (e.g. 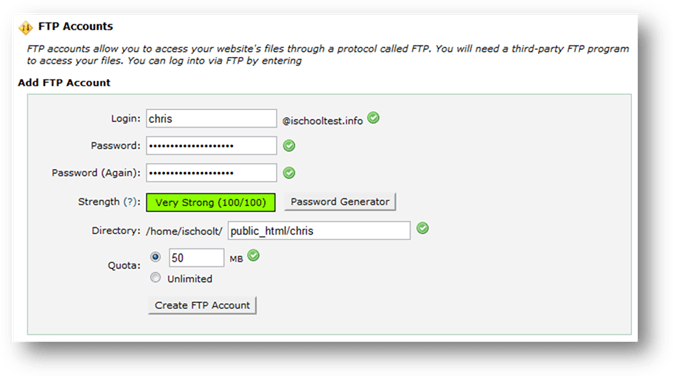 for subdomain chris.ischooltest.info you’ll probably want the document root to be /public_html/chris/). 2. Under the Files section, select FTP Accounts. 3. Enter in the Login name, Password, and Password Confirmation. The Directory should be the folder the subdomain points to (e.g. public_html/chris). Set any desired quota. 4. Press Create FTP Account. 2. Connect to your current host and log in with your UW NETID and password. 3. Move the necessary files to a folder on your local machine by dragging them from the right panel to the left panel. 4. Connect to the new host and log in with your A2Hosting username and password. 5. Move the files you dragged to your local machine to the new host by dragging the files from the left panel to the right panel.